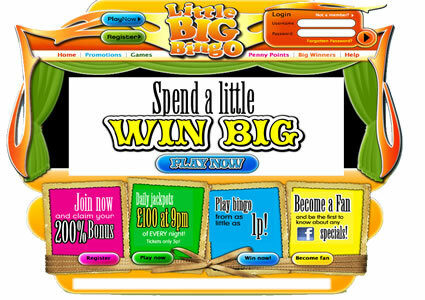 Little Big Bingo is the name of the site previously called Think Bingo Cosy; this bingo site launched on 6th July 2009 and sees the site step out of the shadow of it’s big sister Think Bingo and come into its own. Little Big Bingo, like all bingo sites under the Cashcade hat, is powered by the popular 888/Globalcom bingo software and offer both versions of the internet bingo game that these sites are renowned for. Little Big Bingo boasts ‘cheap as chips’ bingo; ticket prices, where you can play bingo from as little as 1p a go. Penny points will be collected through playing their games, winning chat games, tournaments, competitions and referring your friends. 1,000 PP’s will equal £1 bonus funds for you. Each week they have an additional 1,000 penny points up for grabs in their biggie bonus offer, simply check their weekly newsletter to find out what this week’s number is, or alternatively as one of their chat moderators. Other things on offer at Little Big Bingo include a guaranteed bingo jackpot game for £1,000. This game comes out to play on the last Saturday of every month and all it will cost you to play is 20p per ticket! When the site changed its name from Think Bingo Cozy to Little Big Bingo, players accounts simply migrated and you need not need to re-register and the move to a network does not affect player accounts either. Having said that if you are a new player to Little Big Bingo then you may find you have issues with registration if you have accounts with other brands on the Cashcade network. You may find that upon completing the sign-up form you are told that you already have an account. There is very little to find negative here, game play is good, there are lots of big money games to take part in and instant games aplenty. The only thing they lack slightly is big prize promotions, as most of their offers are static and do not change from one week to the next. This site offers many ways in which players can alter the way there bingo tickets are sorted. They also offer the ability to manually mark your bingo tickets. You can alter the audio and graphic settings as well. All of the settings are available in the top right hand corner of your screen under the ‘options’ button. The number of rooms available is minimal in comparison to some but there are still plenty to cope with the customer base that Little Big Bingo currently has along with the choice of games. Progressive jackpots are available and vary from room to room. In 90 ball bingo rooms you have to call a full house bingo in 44 numbers or less and in 75 ball bingo it’s 46 numbers or less on the Progressive Plus pattern and then you take home the prize pot shown at the top of your bingo screen. 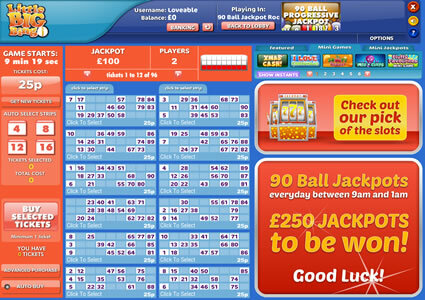 This brand offer a selection of guaranteed jackpot games and the big jackpot games can be found under the ‘Pre-Buy’ from the main lobby. Currently the biggest jackpot on offer is £5,000 in a game played at 9pm every Saturday – Tickets cost just £1 each to purchase. Head over to the promotions section to see the other Guaranteed Jackpot games that are offer at Little Big Bingo, or alternatively just take a look under the pre buy tab in the bingo lobby. You will find that all their big guaranteed jackpot games taking place at 9pm every night, but lots of other small guaranteed jackpots are up for grabs throughout the day. Check out their guaranteed Jackpot game schedule for full details. The bingo side games on offer are wide and varied; there is something on offer for every taste in the selection this site offer. You can choose from slots, instant win games, superslots, table games and scratchcards. 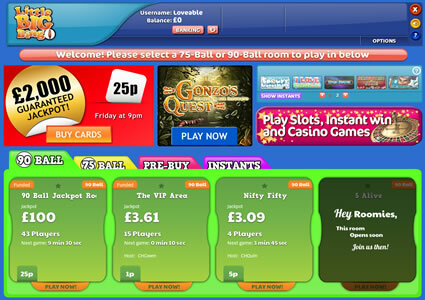 Some of the bingo side games available open in a separate window so as not to cause disruption to your online bingo game. 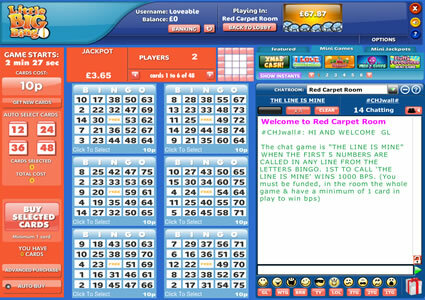 Some games area available to play in the same room as your bingo game, these open above the chat on the right hand side of the screen.